There is a LTD Boss Legend version of Bryant Young that quicksells for 500,000 coins. This item will only be in packs for a limited time. You can earn the Michael Vick and Reggie White's Power Up items by completing their solo challenges in the Legends section. There are Legend Sets for both Michael Vick and Reggie White that you complete in order to get the 91 OVR Boss Legend version. These sets require every other Legend version of the player. 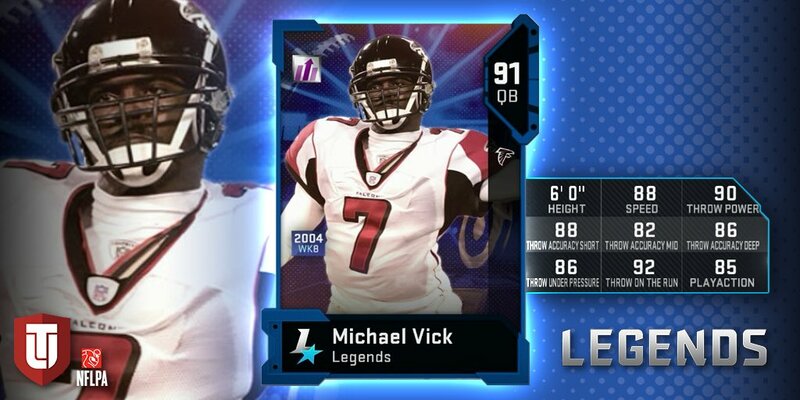 For example, Michael Vick's Legend set requires you to put in the 89 OVR, 87 OVR, 85 OVR, 84 OVR, and 83 OVR versions. What do you think of these new MUT 19 Legends? this is so great. if you play h2h, you will face Vick teams all over the place because even the upgraded power up version from the solos totally op. and if you wanna play solo battles or solo drafts, the game completely dumbs down your team and you end up playing a quick sand version of football. great job EA, great job. Too early for Vick, I wish they would give him a break for Madden 19. 500k quicksells for LTD is such a scam. And they only come from points only packs. So no matter what NMS will never get these cards. Thsi whole game is garbage the ultimate team needs to be fixed when you play squads or h2h the running game is not the same as madden 18 which it should be and everything is so glitchy, If the game is gonna stay like this i want my damn money back. If I power up players they can't be auctioned. How to I sell vick by adding training points and then sell them? Power Up players can be sold either by powering all the way down, or powering all the way up. All inbetween versions are NAT.